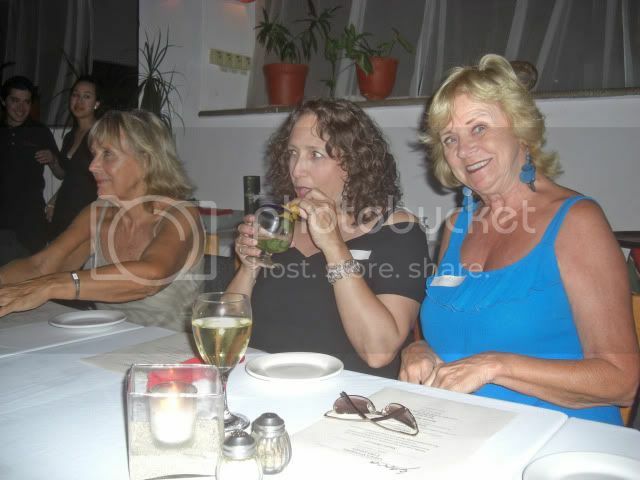 The other night we went to another one of Gary's soirees and joined his groupies for dinner at epoca. I don't know why we keep following this guy around. Maybe because he is so adorable. As usual he had quite a good turnout. 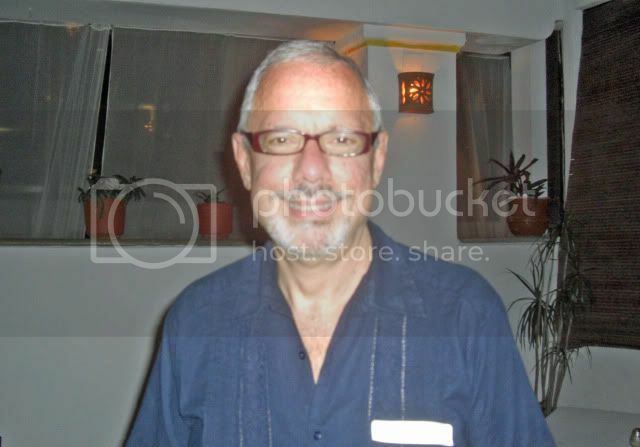 Could This Be The Missing Lorenzo? 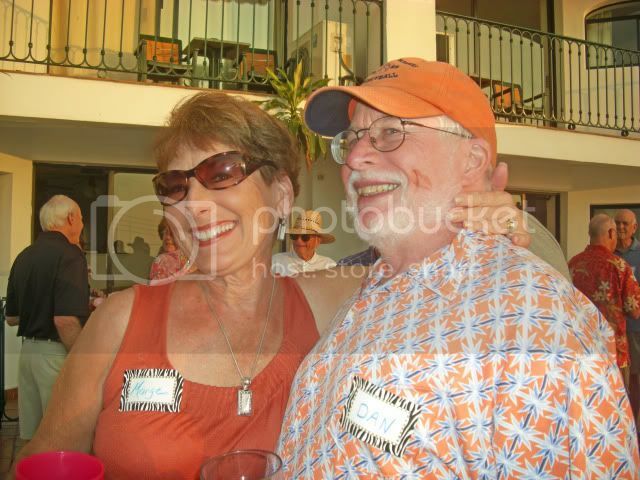 Our friends Randall and his wife Andrea were there as well. 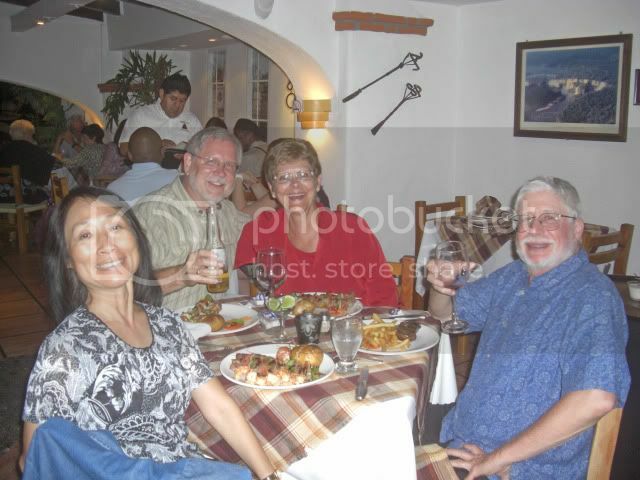 You may recall that I met Andrea and Randall at the Fusion Gourmet at another one of Gary's affairs. 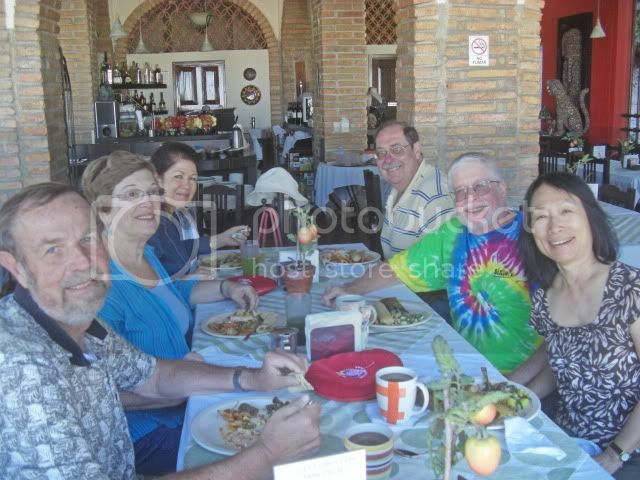 That is a great thing about Pureto Vallarta, you are always meeting interesting people and making new friends. And Gary's little get-togethers are a great way to do this. You may remember that Randall was playing the mandolin at the art show I went to awhile back. 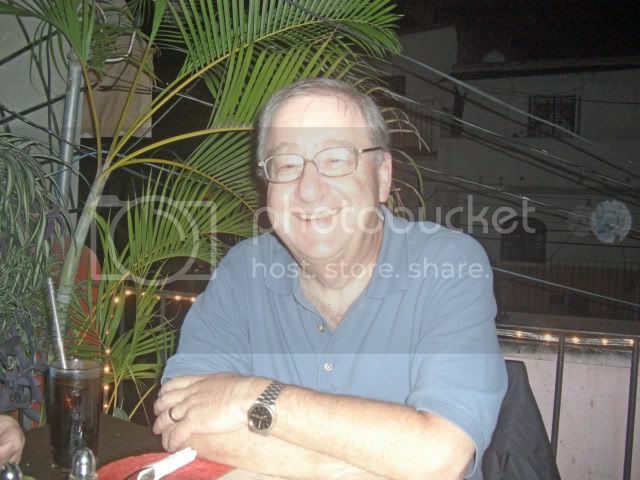 This Tuesday he is playing out at La Cruz, a small town a little north of Puerto Vallarta. 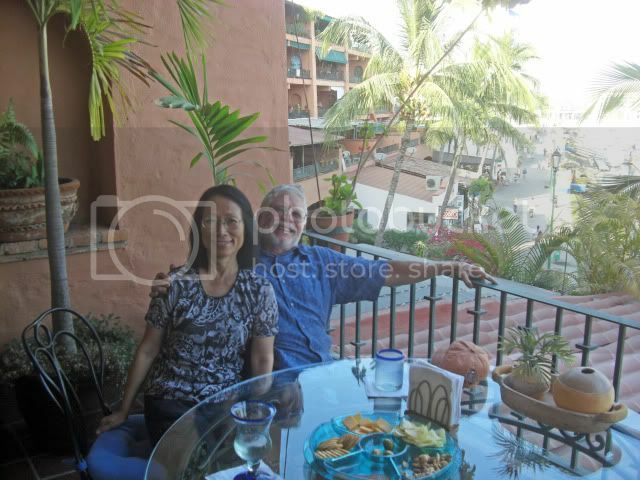 The Mysterious Chinese Woman and I are going to hook up with him and his wife at their place out by the marina for a cocktail and then heading out with them to see him play. Now that should be fun. 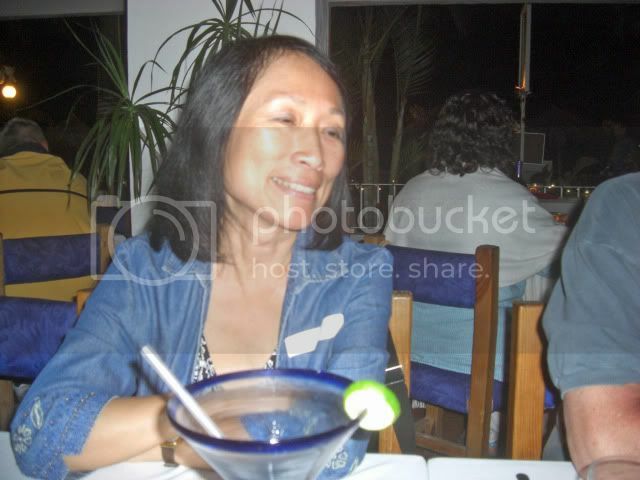 Of course the Mysterious Chinese Woman was there slurking down her Margarita. She always complains that my pictures make her drinks look big and are giving people the wrong idea. I tell her she should order smaller drinks. But Does She Listen? No! And you will notice that her drink is empty. We got a pretty good deal at epoca, just 165 pesos for a three course meal that included your choice of tortilla soup with panela cheese, avocado and pasilla chili, a sweet potato salad with orange slices, arugula, goat cheese, caramelized pecans and sweet peppers or nut encrusted panela cheese with mango salsa and mixed greens for an appetizer. Now if those don't make you hungry nothing will. Our entry choices were mahi-mahi with Veracruz style salsa, rice and veggies, herb chicken with a chipotle-saffron sauce, mashed potatoes and veggies or a braised beef shank in a mild birria sauce, mashed potatoes and sweet corn. The sweet corn prompted me to descrbe the inefficiency of a pig's digestive system and how Smithfield farms are able to reclaim about 70% of a pigs waste and feed it back to them. You can imagine where this conversation went. Let's just say it wasn't pretty. 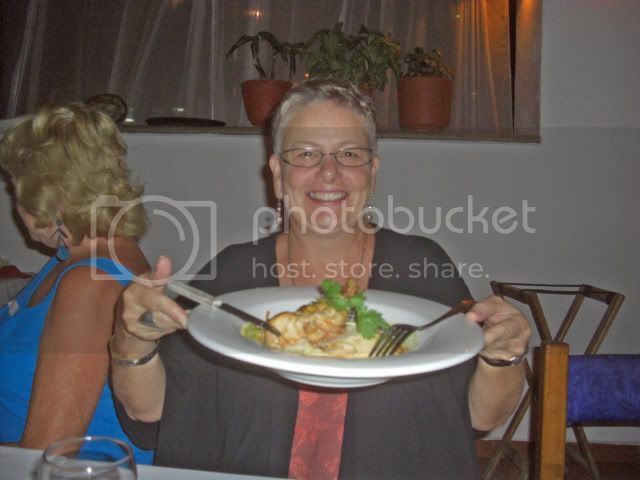 You can see that the portions were more than adequate and Andrea said it was very good. I had the braised beef shank and it was very good as well. And, again, the portions were very generous. I couldn't finish my meal, but I did save room for dessert. I had the key lime pie and it was really good. Plus I love key lime pie. The other choices were a flan de kahlua and either chocolate, strawberry or vanilla ice cream. The Mysterious Chinese Woman had the fish but, for some reason, I didn't get a picture. 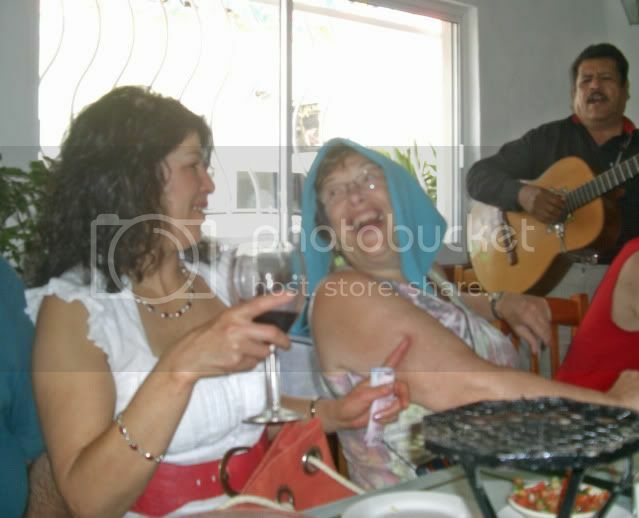 I think her super-sized margarita was always in the way.. All and all another great time was had by everyone. Yesterday a bunch of us went to Pipi to celebrate Peter's birthday. Pipi is always a crazy place and, as you can imagine, everyone had a fun time. But I shall post about that little party another time. 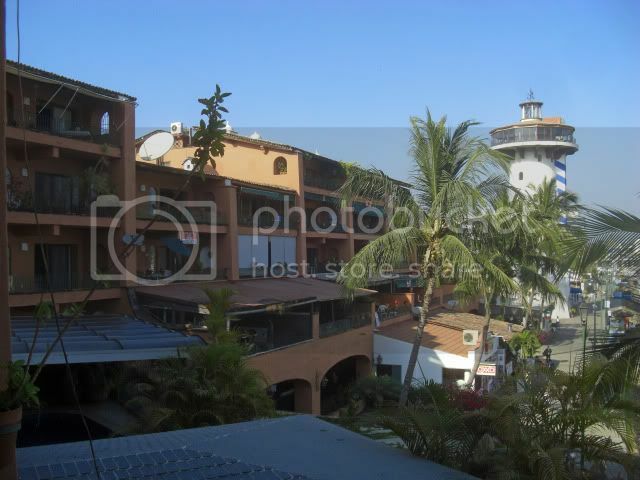 There is always so much going on down here in Puerto Vallarta that it is hard to keep up with everything on my blog. But I will try to do a bit of catching up. 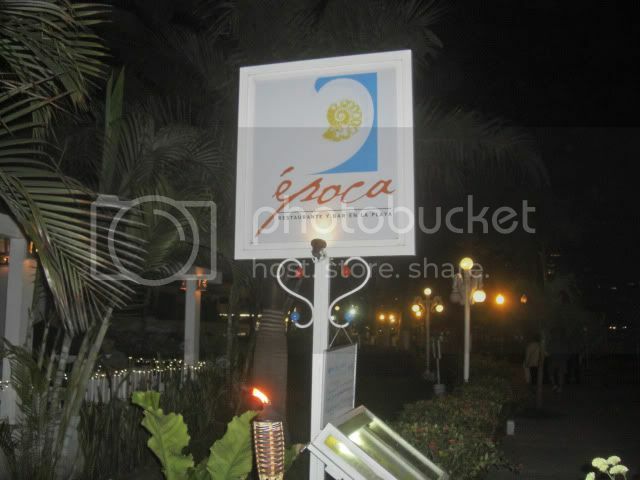 Last night a bunch of us went to dinner at epoca, a beach-side restaurant just a little bit down the beach from us. But, before I get to that, and it may very well require a separate post, here are a few of things we have done over the past several days. The place where we stay has a monthly pot-luck deck party and, as always, I made my much beloved deviled eggs. The Mysterious Chinese Woman made her soon to be famous chili. I didn't take too many pictures, but I had to have one taken of me with Marge, an old and dear friend who color-coordinated her outfit and her lipstick to go with what I was wearing. These parties are always a nice way to re-establish old friendships as the same people tend to come down here year after year. As always we had plenty to eat and drink and just generally caught up on everyone's gossip. Several of us also hit the River Cafe again and this time I did get the Lamb Osso Buca and it was, indeed delicious. 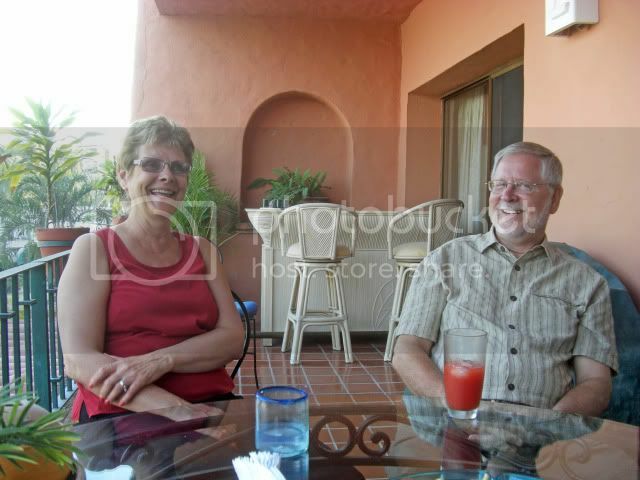 Then our friends Sharon and Paul who are staying out at the marina until their unit here is available at the end of the month invited us over for cocktails. 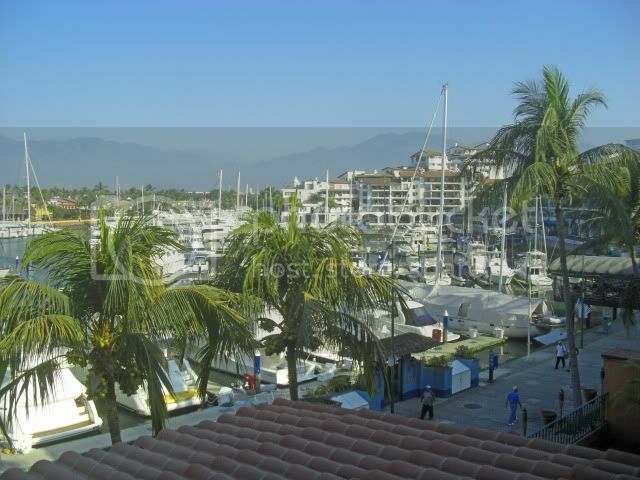 They have a very nice view of the marina and you get to gaze out at the fancy yachts moored there. 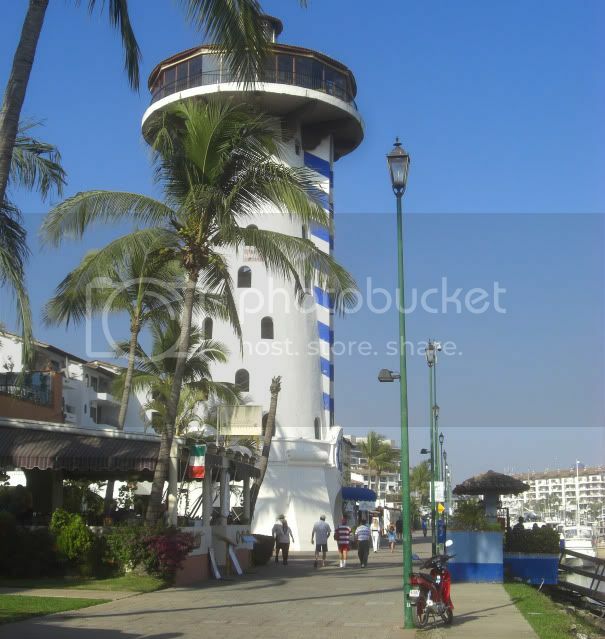 The lighthouse that you see has a nice bar up on the top. I have had drinks up there before and you get a pretty nice view. It used to be nicer before some of the relatively recent construction of towering timeshare, well, towers. Not the kind of places I would ever want to stay, but to each their own. But Sharon and Paul's deck was a pretty good place to have a cocktail as well. There are a lot of nice restaurants surrounding the marina and after our cocktails we went out for dinner at Rincon de Buenos Aires, a very nice Argentinian restaurant. I don't know what everyone had, but I had a really delicious flank steak and the Mysterious Chinese Woman had beef chunks and vegetables on a skewer. She had more than she could eat so we brought the leftovers home and I had a couple of chunks the next day. Even cold they were still tender and juicy. Certainly a place to which I would return. 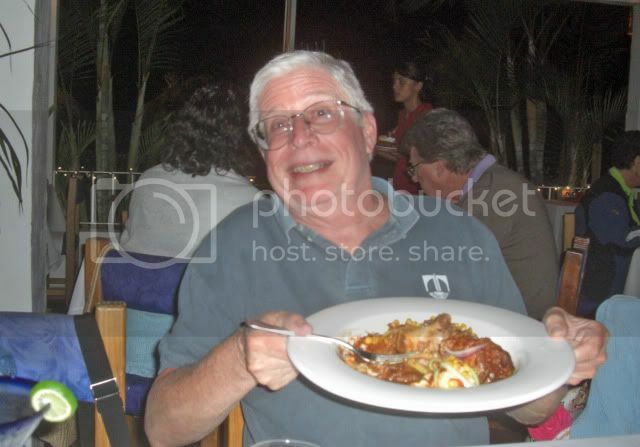 And, of course, a dinner at Que?Pasa, formerly Sweeny's, is always a favorite. You probably already recognize Peter and Maria. 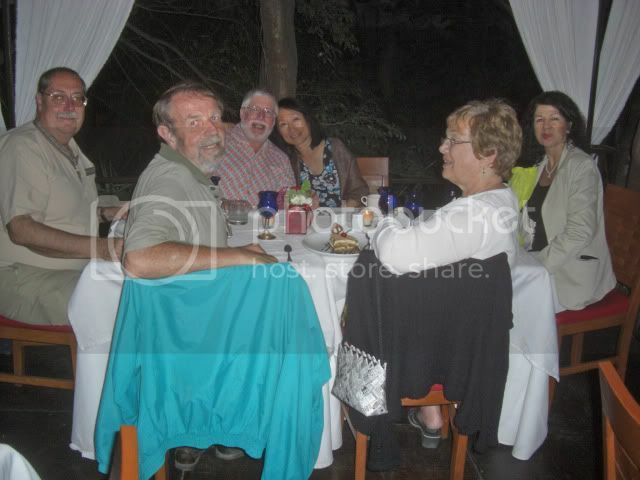 We were joined by friends of their's Irina and Mike. Mike was kind of tucked away in the group shot so I figured I better make up for it. Actually, I wasn't in the mood for either the pork chop or the meatloaf so I ordered the shrimp special. It comes in a large bowl shaped glass and you are supposed to get fourteen shrimp. They are served in a warm broth and it is usually pretty good. This time, however, I only got six very small shrimp. When I complained and showed the waitress the six tails she said that not all of the shrimp had tails. When I assured her that all of the shrimp did have tails she didn't seem to believe me. She went into the kitchen and returned with the cook who apologized and said they only had six shrimp left. Hmm, you would have thought they would have said something before serving them to me. Oh well, they didn't charge me for them so who cares. 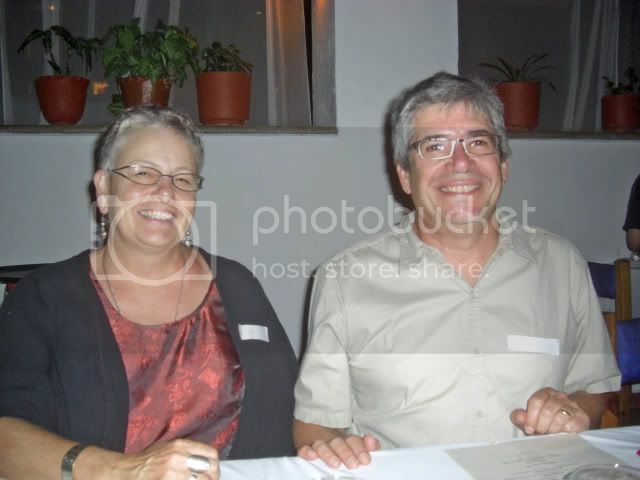 Just a couple of days ago our friends Bill and Marcie arrived in town. They are staying at our friends Tom and Bella's place until their unit is available at the end of the month so we went out to Tom and Bella's with Pete and Maria to greet them and have a nice little barbecue. 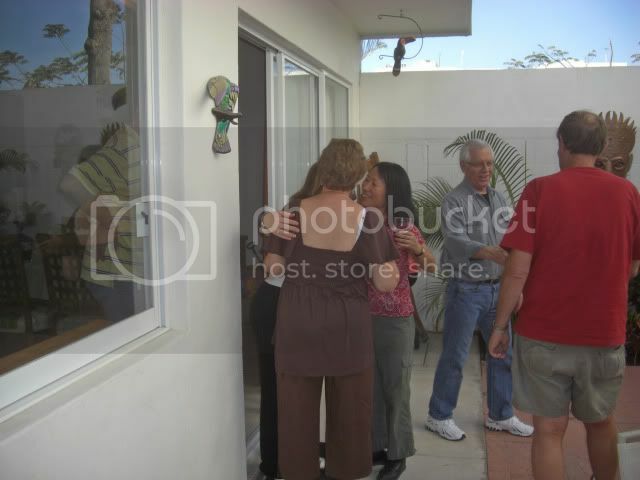 Well, you can't really see much of Marcie, she is in the group hug. 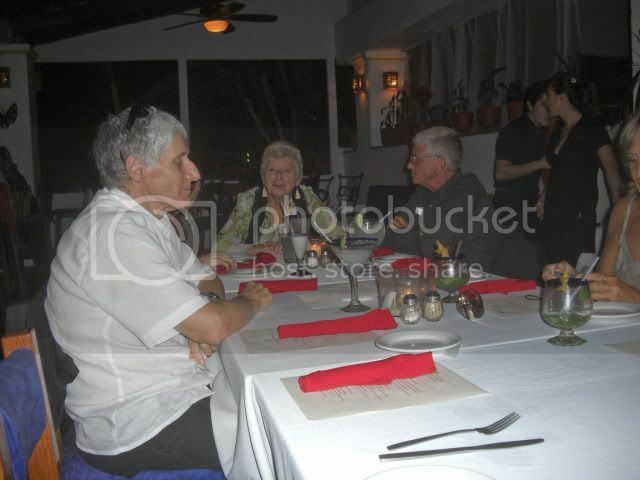 Bill is the guy in the middle of the picture. We got so engrossed in catching up on our vaious physical ailments (this is what old people do) and having a jolly good time that I didn't get around to taking any more pictures. A pity, really. We did have some mighty fine chicken and a delicious key lime pie type of dessert that Bella made. And that pretty much ahould bring you up to date on the recent events here. 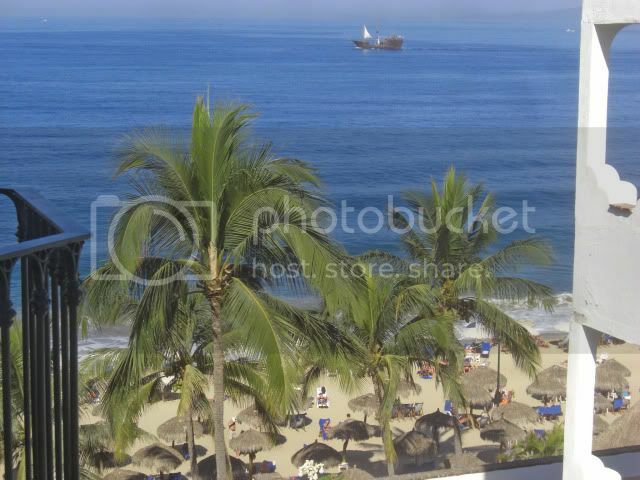 I guess I will save epoca for a separate post, but I will leave you with a picture from my balcony. Today a bunch of us went to Pipi to celebrate Pete's birthday and that will have to wait for another post as well. You will see that we had a great time there as well. But then having a great time here is pretty much par for the course. And it sure beats the hell out of the cold rain and fifty mile-an-hour winds that they are having back home in Brooklyn. Well, it wasn't at my at my mama's that we were having breakfast. 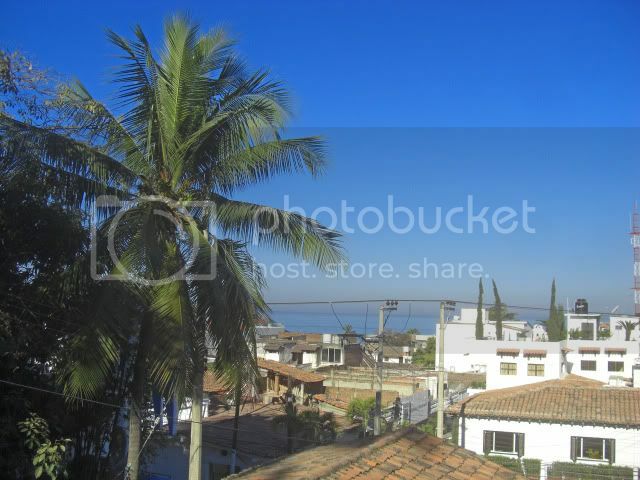 This is a semi-hidden gem that is a bit off the beaten track, but getting to be fairly well known among the gringos. It has long been a favorite of the locals. 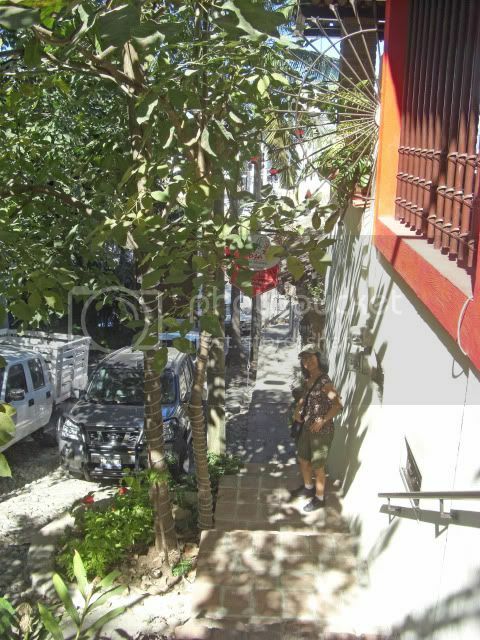 It is up from the malecon and across the street from Cafe des Artistes and then up and up and up a set of stairs. 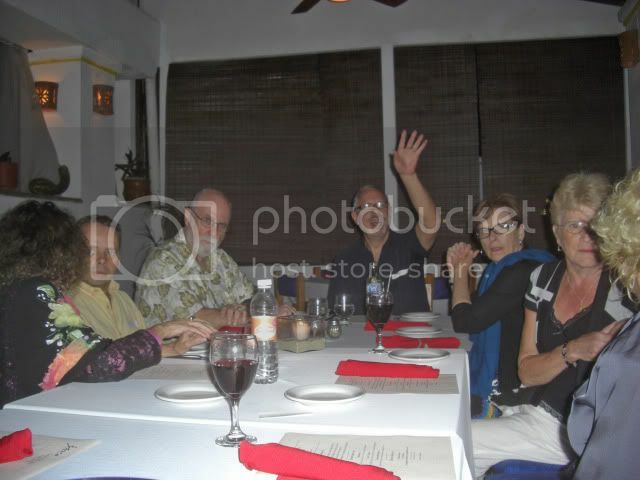 I mention Cafe de Artistes only because it is probably the most expensive gourmet restaurant in Puerto Vallarta. I have been there a few times and have had experiences that have ranged from sublime to so-so. And for the prices they charge so-so is totally unacceptable. Unlikely that I will ever return. 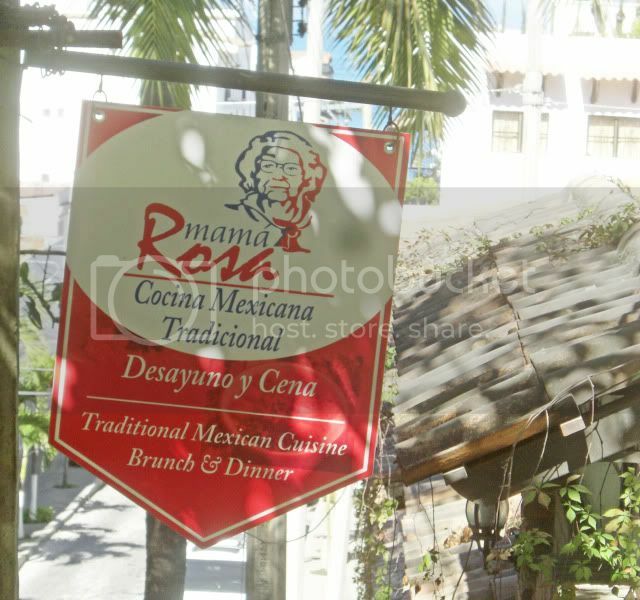 But this is about Mama Rosa's, a place I would most certainly return to again and again for truely authentic Mexican food in a lovely setting and friendly service. I think Mama has passed to the great beyond, but I think it is her son runs it now, but don't quote me on that. It used to be open only for breakfast, but they now have a dinner menu as well. Breakfast is buffet style and, sorry to say, I didn't get a very good picture of the offerings. 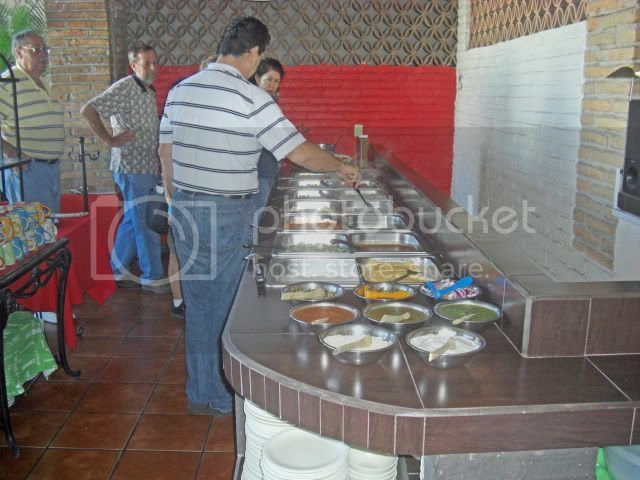 I did get a picture of part of our crew lining up for the food, though. It is all you can eat and this was my initial selection. 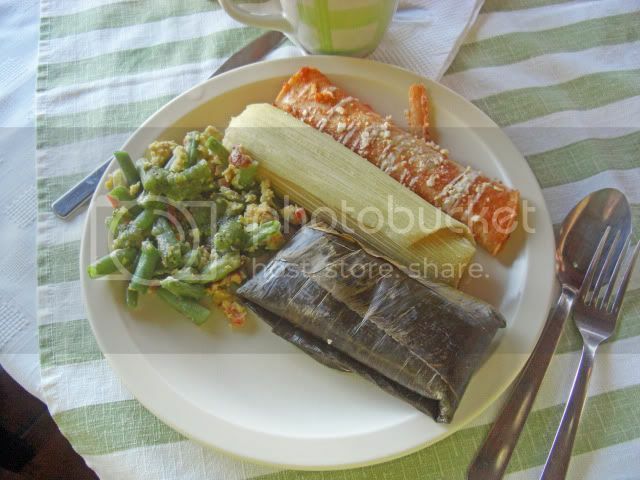 I had two kinds of tamales, green beans and eggs, which is a Mexican breakfast specialty, and I don't know what the other thing was. Very good, though. They also served an excellent coffee. 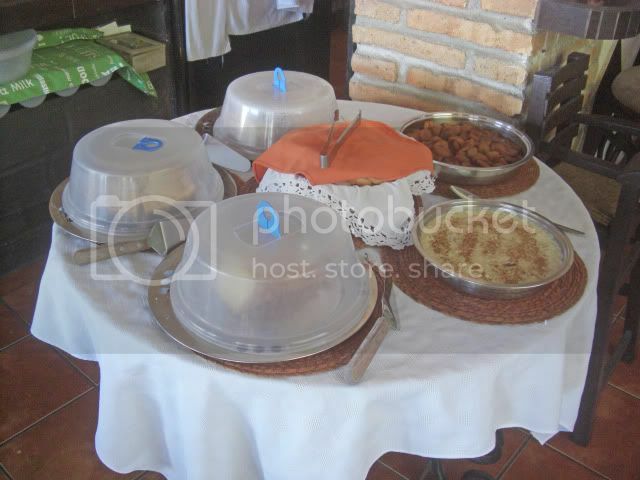 They also had a nice selection of deserts that included, according to the Mysterious Chinese Woman, a most delicious rice pudding, flan, of course, some other stuff that I am not sure about, and fried bananas in a sweet caramel sauce. It was the fried banannas that I had, and they were exceptionally good. From where we sat you also had a nice view over part of the town and the bay. 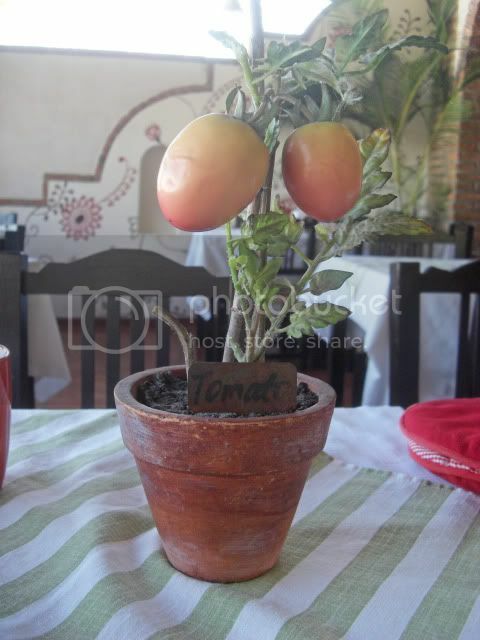 There table decorations were these interesting tomato plants. Not like the tomatoes that you see in the United States. "Tomato" is one of those words, of which there are many, that are the same in English and Spanish. I think "banana" may be another one. Also "no." As you can see from this picture that I took on our way out, you do go up a lot of steps to get here. 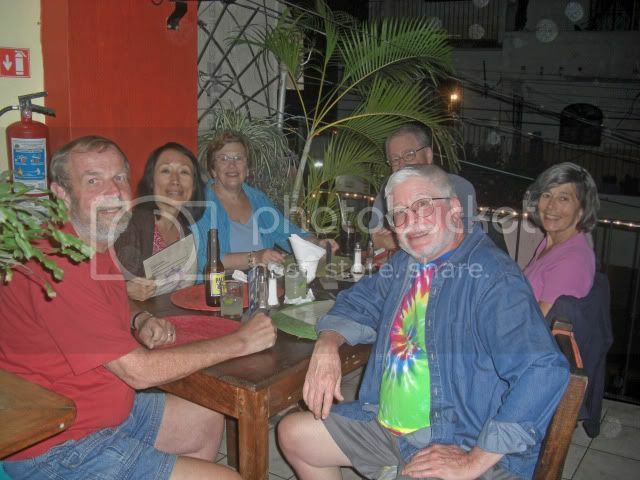 Mama Rosa's might be a bit out of the way and require a climb, but if you are in Puerto Vallarta and don't make it here you have really missed out on a great place. The combination of delicious authentic Mexican food and reasonable prices in a family run and home-like atmosphere simply can't be beat. Princess Letizia of Spain, French first lady Carla Bruni and Michelle Obama. Guess which one is telling our children about fitness and how to eat? I know, I am going to hell for this.